Is your enrollment pipeline leaky? Do you ever wish you had a system for nurturing student prospects through an automated email marketing funnel? You won’t want to miss this episode of the College Marketing Podcast. 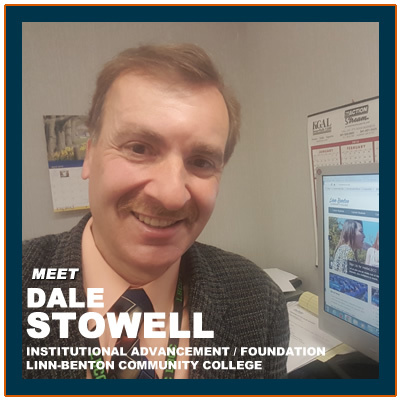 Today we talk to Dale Stowell, who is the Executive Director of Institutional Advancement / Foundation at Linn-Benton Community College in Albany, Oregon. He recently gave a mind-opening presentation called “Your Enrollment Machine – Some Assembly Required” at the 2016 NCMPR conference. Linn-Benton Community College has developed a systematic approach to stabilize enrollments and manage student prospects from start to finish – from the time they first become aware of the college through the point they actually enroll. This podcast examines the college’s new system that relies on a “progression-based model” involving marketing, outreach, admissions, registration, advising and instruction. There are some great takeaways to be had from this interview. You have had a pretty long career in higher education. Can you tell us a little bit about your career journey and how you came to your current position at LBCC? Stowell: Yeah. I’ll start by saying that my own higher education journey started right here at LBCC as a student so it’s a thrill to be back here. In my career, I began as a journalist. I did that for 10 years and when I transitioned to marketing and public relations, I wanted to do something meaningful. Really, I wanted to work at a community college, because it had meant so much in my life, but unfortunately I couldn’t find one to hire me. I got a job at a catholic hospital in Tacoma, Washington and that’s where I really learned the power of systematic marketing. I worked with a brilliant vice president there. When she came on board, the hospital was losing about $500,000 a month and by the time she left 7 years later, it was posting a net gain of about $1 million a month, just a huge turnaround. While I played a relatively small part in that, I sure learned a lot. From there, I ended up working in a couple of Tacoma area community colleges, where I tried to adapt what I learned in healthcare. I did that for almost 20 years. What finally got me back to LBCC was really a fluke. Every time I went to a community college marketing conference, if somebody from LBCC was there, I’d always go up and introduce myself and so I got to know the people who worked in the marketing office here. At a conference back in 2011, I saw Joe Sherlock, the marketing working manager here to this day and I said, “Hey, what’s going on at my old alma mater?” He said, “Well, my boss is retiring and so we’re waiting to see who is next.” After a couple of days, I started to wonder what Joe’s boss did. I went on the LBCC website. I wasn’t looking for a job. I was very happy with where I was at, but it was like, it was a perfect fit. I’m back now helping the institution that really set me on my way. It’s great. That’s really neat. I have a little bit of experience in healthcare marketing as well and I was also talking to the director of marketing at Casper Community College in Wyoming, also recently came over from a hospital background. Do you think there’s a lot of similarities between marketing in hospitals as there are with community colleges? Stowell: There are certainly a lot of parallels. You’ve got, the gate keepers in healthcare are different than the gate keepers in education. The political structure is, there are similarities there too. They both tend to be large bureaucracies, so understanding how to navigate those is a key to success, but yeah, there are a lot of parallels out there to higher Ed. You were at the NCMPR Conference in St. Louis recently, what did you think of this year’s conference? Stowell: As always, it’s a great conference. Some of it is learning and some of it’s confirmation that you’re on the right track. Some of it’s mutual support and then when you do what we do, that’s a good. A good conference, yeah it was great. Medford: That’s awesome. Did you get to enjoy St. Louis a little bit? Stowell: I did. I walked down and I touched to the arch. Medford: Oh wow. How did you I do that? Stowell: You see now, I know you were there. You can’t let the fences deter you. There was actually a part of the arch that you could get to, so I just walked down and touched it. I had dinner with my district compatriots at Pappy’s. Best ribs in America according to the Food Channel. Medford: Yes, it’s very good. Stowell: It’s good to appreciate St. Louis a little bit. Medford: Absolutely. I went to Pappy’s myself and it did not disappoint, that’s for sure. Stowell: No, not at all. I was warned to not order the large portions and I’m glad I took that advice. Medford: I went a day where I fasted breakfast, lunch, so by the time I got to Pappy’s, I was like, “You know what, I’m I’m getting the full rack of ribs.” It was good though. You gave a really powerful presentation I thought. I had the opportunity to sit in on your presentation. Tell us a little bit about the topic overall and what made you decide to speak on what you spoke about. Stowell: It really goes back to the idea of being systematic in your marketing approach and so we picked a title, the enrollment machine that some assembly require because, we do have all of the pieces at the college, but they tend to be separated organizationally. We’re not all located in one area and so identifying what the gaps are in a typical community college or a traditional community college’s marketing approach. Really wanted to spend some time with my colleagues doing that, sharing my thoughts and our experience here at Linn-Benton and how we figured that out, worked through the issues and are making it work for us. Medford: That’s awesome. There’s so much more technology available today to allow you to do what you’re talking about and I think it’s definitely a valid topic, a very timely topic. Stowell: Yeah and that is the key because without it, it would be so labor intensive, it has to be almost impossible. Now, you started off the presentation, you asked everybody what is the value of a $20 bill and everyone was like, $20. Your point was, it’s $20 because we all believe it is worth $20. You used that as a metaphor to explain the power of mass belief or delusion. Tell us about what does the power of mass belief mean for community colleges? Stowell: One of the key things that we have to work to overcome in the marketing areas is, this idea that if people just knew our story, all of our enrollment problems would be solved. There’s no doubt that people need to know us and love us, but there’s a big gap between that and getting people to enroll. If you don’t address that, you don’t really have good control over your enrollment program. Another thing you brought up was the 4 Ps of marketing and I thought that was really good because I think a lot of times as marketers, we just easily lose ourselves in our daily jobs and we don’t get back to the basics of marketing, the 4 Ps. First of all, what are the 4 Ps and why do you think we do need to go back to the basics as community college marketers? Stowell: Going back to the basics, it’s never bad. One of the reasons it’s important to have the 4 Ps in your pocket is, they’re a great way to talk to people who aren’t marketers. I think one of the key issues that we face is we understand it so well that we don’t know how to talk about it. The 4 Ps give us at least some vocabulary. Product; what is it that we’re trying to get people to use? Place; where can people get it in relationship to where they are? Price; what does it cost them? I think cost is almost a better description, because that … Cost isn’t always about finance, it’s about time as well. Then promotion, do you know the story? Obviously there is a story that has to be told and one of the fundamental challenges we face in marketing offices at community colleges is, almost all of it started off as public information offices and our structures still reflect that. We are the storytellers. We’re getting the information out there and even though we’re often called marketing, the pea that we’re really resourced to do is that last one. Promotion, but it leaves a gap. We just live in that area [promotion], but when it comes to price, you mentioned some things in your presentation that I found really interesting. What is different about community colleges today than it was just 20, 30 years ago? Stowell: Price is one of those. When I was a student here at LBCC in the late 1970’s, I’m old. My tuition adjusted in today’s dollars would be $390, but our tuition, our actual tuition today is now $1500 for a full time student. To think our work much easier would be to market it to the institution with the tuition rate of $390. We like to talk a lot about how we are affordable. We’re really not. If you don’t have a good financial aid package, even people who are gainfully employed have a hard time coming up with $2,000 every 3 months that’s not already in their budget for tuition and books. There are just a lot of other options now. There are online colleges. There are other ways of learning, particularly YouTube. You can learn how to do almost anything on YouTube now. I’m always on YouTube trying to figure something out. There’s CodeAcademy. There’s a ton of different ways now. It’s not yet credited, but there are just different ways. We have much more competition and we cost much more than we used to. Medford: No, absolutely. I really see YouTube really having a pretty big impact on a lot of continuing education courses. Medford: If you want to learn pottery or just a number of different things. If you’re working on your car. I think a lot of people are just kind of skipping out on the process of taking the time to go to a pre-scheduled class and go on the YouTube route. Stowell: Yeah. I can’t tell you how many repairs around my house I have done via the support of YouTube. Medford: Absolutely. Me to. That’s how I learned how to do this podcast. You had a really great graphic and I know it came from another company. You can mention the name, but tell us about the enrollment pipeline and what that should look like for community colleges? Stowell: Yeah. I think first it really should look like a pipeline without gaps. The graphic that you’re referring to was titled the leaky pipeline from interact communications and it showed every step where your students can leak out of your roman pipeline. Whether it’s financial aid or a bad experience in admissions or not being able to get the classes that they want when they when they need to get them. One gap that really even missed it in the show was the gap between knowing about college and enrolling. I don’t think that there are many people honestly who see a college, a billboard or hear a radio ad and think, wow, I better head down to the college and enroll. It only happens if you’re just reminding them of something that they already decided and committed to. A pipeline needs to be built to systematically take people from image and awareness, to a place where they can express the interest that grows from that. If we want to be stronger with our enrollments, we need to be involved in that as well and particularly if we’re trying to reach out to new populations. Under-served populations. First time college students. We need to be in in that game as well or to move them from I know about you and I think there may be something there for me to be getting them to commitment. Going back to that leaky pipeline. One great thing about that particular graphic is, it really broke down the different responsibilities throughout the college and it’s not just marketing, its job to get that person enrolled, but you have student services, it has a play in it and there was a number of different departments. Tell us about who is responsible for the pipeline and the life of that student while they’re at the college? Stowell: We’re lucky. Actually when I interviewed for the job here I said I’m a lucky person. Hire me or hire my luck. That was part of my ticket to be hired because I’ve always … Things just seem to happen magically when I’m around and it’s happened here too with a structure called The Progression Council. That as they got everybody that needs to be involved in marketing in the room at the same time and at a very high level and to hide in a group that we had created called marketing outreach that involved the marketing group outreach, admissions, registration and interaction, to talk about the issues that affect enrollment. It wasn’t just we need a better billboard or more ads, it’s we need a better approach to communicating and getting people off on the right foot so that they not only get in here, but they’re successful once they do get here. Did you have trouble getting buy in from these different groups because when I talk to community colleges about setting up the marketing automation platforms for them, a long time just like we’re only responsible for this part of it and I don’t really care what happens beyond that and which I think is really the wrong attitude. Do you see and hear that from your peers at other places and do you experience that yourself when you guys first started this track? Stowell: Yeah. For sure. I think that that’s the hallmarks of bureaucracies and large institutions that there’s always going to be a bureaucratic structure, it is going to be there. It’s not like we can suddenly become something else. Everybody is in their lane, they’re doing their jobs and really they’re doing them well as they’re defined, but when there’s a gap between the lane, that’s where the problems start and when you’re in your lane, doing your job well and there’s a gap, it has to be somebody else’s fault. I think it’s that gap between image and awareness and commitment that has marketing offices and admissions offices pointing fingers at each other and it doesn’t lead to good relationships and they’re co-presented with our global services director Danny Aynes at the conference who oversees those areas. We didn’t start off having a very good relationship. Really starting out, I’ve seen that at every community college I’ve worked at. The only way to deal with that or at least the only way I can think to deal with it, is to get everyone in the same room at the same time and go through what is always an uncomfortable process that takes months of turning a bad relationship into a good one because cooperation outside the lines is really the only way you can get to the strategies that gets areas working together and getting along. That’s great and we’re going to get into the results of that later on so people will see what happens when you do work together, but tell us about this marking outreach group, who all did you bring to the table in that? Stowell: Yeah and this really was the key for us. I think that, so we brought marketing obviously, the outreach personnel, admissions personnel, instructional leadership, so we’ve had a rotation of means depending on what programs we’re having a specific focus on. I am, there are different ways to do this, I’m not sure I would recommend my approach to everyone, it depends on your personality. I’m not process oriented and so the idea of trying to design things by committee or write things by committee, I don’t think that’s a good … It hasn’t been a strategy that I can figure out how to make work for myself, so really I brought a plan. I wrote a plan and had people react to it and of course when the relationships were strained to be, the first reactions weren’t really positive, but I think that if you’re working with an idea, you could show how it’s worked in other places. You’re respectful of people’s differences of opinion that the process of making adjustments to an existing plan and getting people on board to implement it is something that worked for us. That’s great. Now you guys are, what you’re doing is really essentially, it’s marketing automation. With marketing automation, you really have to have a technology platform to work with. What platform are you guys using? Stowell: We use a platform called Audition Soft, there are many platforms that do this. What it really allows us to do is to collect information online about prospects and they tell us what they’re interested in. They’re just check boxes and give us contact information. From there, we can communicate with them through highly personalized but pre-built information campaign where we drip out Information. Now, by drip I mean a little bit of information at a time rather than a 3000 word e-mail. We can do that via e-mail or text. We can text people reminders, send them to places online and it all depends on their preferences. We can build a campaign so that they’re tailored specifically to people’s age and their interests. I think a lot of community colleges just, they basically just have the ‘apply now’ button. what are you guys doing to really capture leads the head of that and then be able to market and tailor those messages for those groups? Stowell: Yeah, it really goes back to looking at what’s your gap in the pipeline? Is there a gap between the billboard and the ‘apply now’ button? What we have, there are all kinds of indicators along the way that if you have a system like this that can give you an idea if you’re on track, so we’re trying to get X number of prospects into our main system, so even that’s something that we try to get. We’re trying to get X number of applications, so we’re trying to move them through the series of messages. Sometimes these messages can be stretched over years. We’re back to far half time’s break as now and we plan to go all the way back to junior high we’re still the building up the various and message campaigns. That the idea, is to give them something that is a low commitment, just tell us what you’re interested in and we’ll send you some information, but we’re building that either by inviting them to events, being in contact with them, texts and e-mails. We definitely are trying to get them to the ‘apply now’ button. Then once they apply, we’ve got, we have another set of things that we do to get them to enroll. We have a lot of applicants who applied and we never heard from them again. So you have messaging that you’ve already pre-built, pre-scheduled so day one after they apply they get X message. 7 days later they get another one. A month later they get this, is that the idea? Stowell: Yeah, exactly. Now and since they’ve told us things that they’re interested in, interspersed with the things that we really think is important for them to know is our messages that they’ve asked for. It’s a lot easier to keep somebody interest If you’re actually sending them stuff that’s of interest too. I know it sounds obvious but sometimes we overlook that. Medford: It’s like what you said in your presentation you have to know your audience right? What were your goals? Implementing a Marketing Automation plan? Stowell: Yeah, I think I talked a little, ultimately our goal was to, our goal, we really had 2 main goals and their bottom line goals. One, we wanted to increase our number of new students then when we get into the results of I’ll tell you that we did that. The second one is and really the plan is we’ve been fully implemented for about 15 months, so we don’t really have the data on this one yet, but the second one is if you are in communication with someone over a period of time and you get them to enroll. I really believe if you sent them the right information, they’ll be more successful once they get here. That they’ll be better prepare, that they’ll have more problems solved, that they’ll have made more decisions about what they want to study and how they want to deal with any financial challenges. They’ll have more time to have prepared by the time they get into that first class and that should increase their chances to succeed. That’s the second goal. First goal obviously we want more students. The second goal we want to keep the ones that we get here. There are all kinds of other things going on to keep students. We’ve transitioned, I mentioned progression council, that group the first year was most interested in attracting new students. This year retention has become our focus so there are a lot of other things going on at the college but ultimately your involvement is those are the 2 things, the traction and retention. If you want strong enrollment, you have to have both. If you want retention, marketing really needs to be in tune with student services. Stowell: Yeah, good luck, that doesn’t work. Medford: Right, because then that means you’re just going to have to recruit more students right? Stowell: Exactly right. Yeah it’s our business is not like, it’s not unlike any other business where it’s much more efficient to you to keep the customers that you have than to lose them and have to get new ones. Medford: Absolutely and it’s a good way to think of it as a business. You mentioned there are various campaigns that you guys are running, I think you mentioned campaigns from 9 through 12th graders. You’re doing specific campaigns by a program of interest it sounds like. What are some of the other types of campaigns that you’re doing? Stowell: Yeah, so we have in terms of that of pre-built campaigns we’re 10th through 12th grade and then we have a kind of a general adult learner campaign as well. Then we also in the, depending on what people say they’re interested in, we will send them interspersed information about specific programs, so we have at least one message and in some cases more than one on every program at the college. It comes from the program coordinator or a faculty member. It includes information about the program, few lines about job prospects, if it’s a job related program and the contact information. Contact information of some actual human being, not some general info lines. A lot of times faculty are terrified that a lot of people are going to have their contact info. It really turns out that very few people call and the ones who call are really interested and they’re people that they want to talk to because they will be in their program and that’s understanding that people are qualifying themselves in terms of level of interest. That’s an important point to make to the people who have to be involved in the college. Particularly faculty who are even busy with all of the other things that they have to do here. Somebody who uses that contact information is really interested. It’s not a large volume of calls. We also use it to … When we have tours or open houses, everybody in our program … In our database gets a message on that. If when we have a chance that are program specific, we send an invitation to the people who’ve expressed interest in that program. We have a degree partnership program with Oregon State University. We have today one time, more 2,000 thousand students that are dual enrolled in LBCC and OSU and because OSU is only 10 miles from their Albany campus of LBCC. We make sure that we push that option to students because a lot of our students, that’s going to be their transfer schools. We include information on that as well. That’s great. I really love what you’re saying about the personal approach you take with the program area of interest. The person at the admissions office isn’t going to have that same sort of enthusiasm for your program as the faculty that are in that every single day. I think it’s a great idea. Stowell: Yeah. When it also starts the relationship. Honestly, my experience at LBCC was so good looking back because I had such a great relationship with my journalism professor who taught my journalism courses. One of the reasons that I even came in here it is because he visited by high school newspaper class and talked. I knew who he was, so that … It’s very impactful for somebody to have direct contact with someone who’s going to really become someone who’s very important in their lives. You guys have had some success with increasing your conversions on your website. Tell us a little bit of what you’re doing to do that. Stowell: Well, on our website, we looked at the analytic of our site particularly as it applied to new visitors. We figured out which pages new visitors were going to most often. I think we looked at the top 10 pages. On those pages there is … When you go there, there’s a pop up that invites you to sign up for inside LBCC, which is our automated prospect operation management system and that when you click the link, you just enter your name and email address to all. We don’t … That first contact, we’re not asking for a lot. Because we don’t want to scare people away and then they’re in the system and the first message that they get, which is a welcome message, “Thanks for signing up” is something that invites them, so a little bit more involved a page where they can tell us what they’re interested in. We’ve gotten a couple of … We’ve gotten a couple of thousand people into the system that he had the pop ups. How does your marketing automation change throughout the calendar year? Stowell: The automation stays the same, but we do have things that are plan ended and depending on … If we can urge somebody to do something at a better timing. Our application deadlines. We really do have continuous applications, but it’s advantageous for somebody who’s starting and it is advantageous for somebody who’s starting in fall to apply by spring, because there are a whole series, things that we can help them through so that they don’t show up on 3 days before the quarter begins and have a bunch of problems that they can’t solve in 3 days. We have … We timed things based on … Really based on helping the student be successful. Did you have to tweak how your application process, what it was like before online and post? Stowell: Yes. I did. It was so bad. Honestly for me, it’s like it was such a horrible experience that blocked it from my memory so I can’t exactly remember what it used to be, but it was this multi-step process of filling out an online application and then you had to go somewhere else to pay your application fee and then at some point, some week later, you received a piece of mail that told you that there were 6 things you had to do before you became a student. Unfortunately, it’s gone. We don’t do that anymore. You fill out an application online. You schedule your next step, right from the application page, so your advising appointments, sit right there. You automatically schedule it. There’s nothing else that you do. What you get in the mail is a welcome packet with coupons to the bookstore and the coffee shop and stickers throughout the college in a letter congratulating you on becoming a student. Do you have your application process integrated with InfusionSoft, with whatever your typical application process is internally? Stowell: Well, we … Not yet. We’re a Banner school and like some early adopters of banner, we customized it heavily and so we actually really are in the process of getting a back to basics so that we can use some of the modern modules that would make that kind of an integrated more feasible. You’ve also have developed something called the new student center. Tell us what that is. Stowell: Yeah. That’s one of those beautiful things that seemed to happen by magic. It grew out of a subgroup of the progression council. I’d like to think that the fact that one of the leaders that was also on the marketing outreach group that’s helping you deal with this, but what basically is it, is it’s a pop up center. The first one was pop up in the student coffee shop, on campus. It comes up on as-needed basis, weeks ahead of the beginning of the term. New students get a specific appointment. They come in. They have a very personalized experience where people work with them one on one on different things like how to make good decisions about which programs they choose. A lot of times we find that people have just checked a box on the application about what they’re interested in studying to check the box. They’re not really interested in that or they didn’t understand what it was that they were checking and so we make sure that there’s somebody there to make sure that they’re starting off in the right program, that they’re getting the classes they need to get first. Then there are people there that can provide very specific support on how to take care of any barriers a student is facing. It’s just … It’s like the … Again, with that another one of those gaps that was addressed and then this one actually wasn’t even in the marketing plan that we reduced. Something that came out of the program and council, but it is a perfect add on it. It’s just beautiful. What have been the results ever since you’ve implemented all this? Stowell: Well, I mean so … With the new student center, I tell you one of the things we know for sure is that new students are getting gateway classes in l English and math earlier, which is encouraging because we have all kinds of data here that shows that students who do that succeed at a much higher rate. In all honestly, the whole system approach should be concerned like we talked about with retention and not just enrollment, but the overall of that is our new student numbers have been more than 10% for the last 4 quarters in a row. Enrollment has been holding steady. We had mild growth in fall, but when you look at as a relative to other organ community colleges, that’s growth. Everybody else has been declining. We’ve been holding our own and so … Obviously tons of factors in enrollment that you don’t control, but it’s always good to benchmark yourself against others, if you’re really trying to figure out how the plan is working and the new student growth is something that’s very encouraging. So far, even with the relatively young implementation, we’re seeing things that are very, very encouraging. I assume some other people are going to want to get in touch with you after hearing this episode. What’s the best way for somebody to reach out to you? Stowell: My email is always good. In fact, I did hear from lots of people after the NCMPR Conference, so I really believe in what we’re doing. I really believe in community colleges, so if there are people out there who think that they can be helped by that, they can just email me at Dale.Stowell@linnbenton.edu and sure, there will be some way on your website that you can write that out so that it will be easy for people do. Medford: Absolutely. We’ll be sure to put that in the show notes. Dale, thank you so much for coming on the show today. I really appreciate it. Stowell: It was fun. Thanks for having me. Medford: Yeah, no problem. I might reach out to Danny at some point. Maybe he’ll want to come on and talk about some of the follow up on more specifically about how you guys are implementing these campaigns, that’d be really great. Stowell: Danny will be here and Danny is the detail guy, so you would get a lot of information from him.